Automations are sequences of events that you create to fuel your business processes. This guide is an overview of automations and the actions in them. An automation is a sequence of events that you create to help execute your business processes. When you activate an automation, you in essence power up the stations and turn on the conveyor belt that moves contacts from action to action (station to station) until they reach the end of the sequence. An active automation runs continuously until you make it inactive or delete it. In short, automations are the motors of your business processes. They fuel stage-to-stage progression through your pipelines and increase the probability that you achieve — and even surpass — your ultimate business goals. You can create as many automations as you want, and you choose the function of the actions and the order they sit in each sequence. 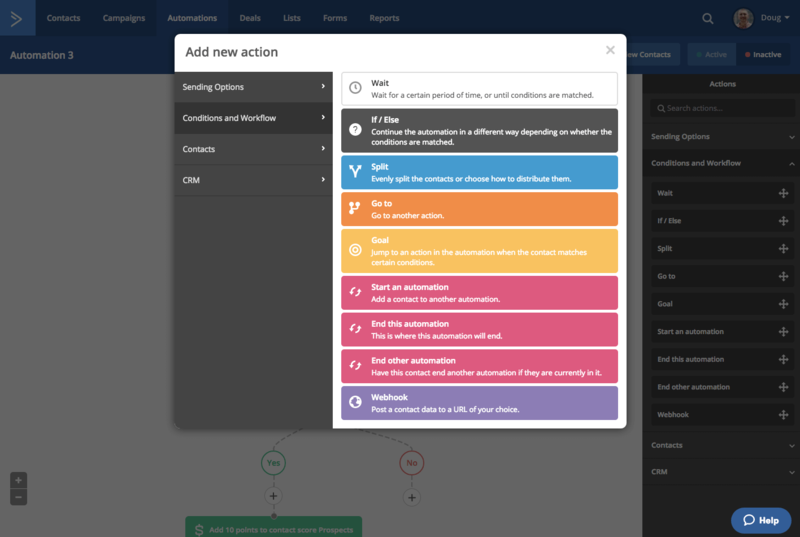 In this guide, we give an overview of automations and the actions in them. Automations can work on a micro and macro level for your business. You could create automations to handle major contact interactions like post-purchase engagement, and you can create automations that execute smaller yet critical tasks, such as updating custom fields. And of course, automations might not be sales focused at all, perhaps serving only to organize your leads or onboard internal team members. Indeed, you can automate any business process you want, big and small. Tip: For bigger processes, don’t feel like you have to account for everything in one automation. In fact, multiple automations (multiple assembly lines with multiple workstations) can operate together to fully automate just one large business process. We suggest keeping automations simple. Before you can automate any processes, contacts have to enter active automations (aka hop on the conveyor belt). In order to do so, contacts must meet criteria that you set. Start triggers are the first of three such criterion. In a sense, start triggers are the primary door contacts must unlock on their way to automations. Shown in the above screen recording are the 20 start triggers you can select. All start triggers pertain to actions contacts take or changes in particular data on contacts’ records (tag is added, tag is removed, etc.). Once such an act occurs, contacts move past door one. As you implement a start trigger, you configure the “locks” for doors two and three (frequency and further segmentation). Read our guide to starting automations for more details, and be sure to watch our success webinar that suggests use cases for each start trigger. Like assembly lines, automations don’t merely transport something from point A to point B. Indeed, assembly lines have workstations that build upon and tweak the original item. Without such changes, the item does not make it down the entire assembly line. Similarly, an automation without actions (workstations along the conveyor belt) really serves no purpose. Yes, automations automate business processes, but for that to happen, contacts must execute each action (workstation) along the way. If contacts do not execute your desired action, they cannot advance down the assembly line. In some cases, contacts must exercise their free will and do something to advance past an action. Other times — usually for organizational purposes — ActiveCampaign automatically executes the action when contacts arrive at that point in the automation. Regardless, all actions in automations affect contacts and work to automate any business process you desire, internal or external. You can also create actions that automatically notify internal team members of another action occurring (telling a sales rep that a contact made a purchase, for example). These actions relate exclusively to messaging. You can send an email or an SMS message. 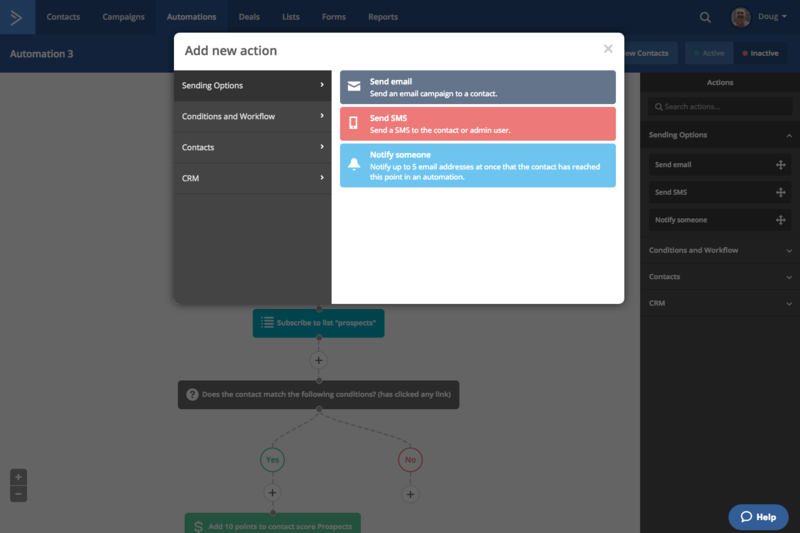 Additionally, you can choose the “Notify someone” action to alert up to five email addresses when a contact arrives at a certain point in an automation. That action is commonly used for internal communications. Essentially, this category includes actions that dictate contacts’ routes through automations. You can add “Wait” actions, which pause contacts’ progression in the automation for a specified amount of time or until they meet conditions. Such functionality can help you send perfectly-timed messages. 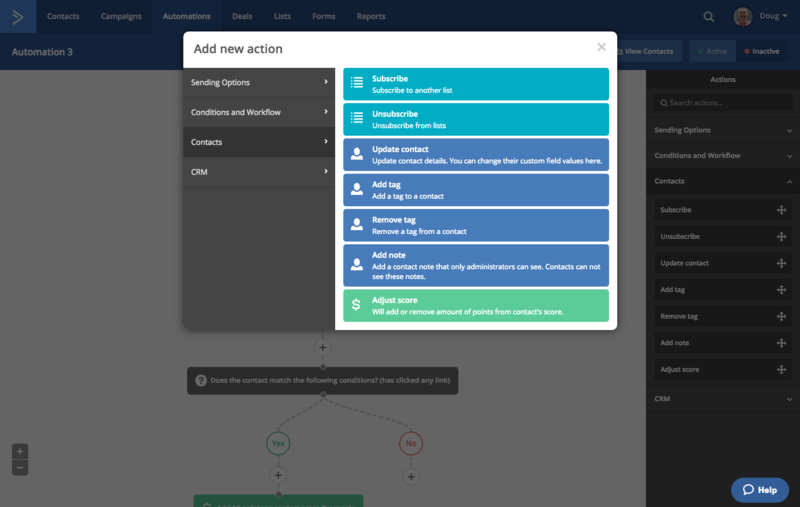 Additionally, you can use actions in the “Conditions and Workflow” category to unhinge one of ActiveCampaign’s most valuable powers: segmentation. Selecting the “If/Else” action brings up ActiveCampaign’s segment builder. With that tool, you can segment contacts to an unprecedented degree. As a result, your engagements are personal and targeted, and the likelihood that contacts convert increases. We encourage you to use our new “Split” action as a way to segment, as well. That action not only splits automations to your liking, but it also monitors which route is more effective and automatically designates a winning route based on criteria you set. The remaining actions in the “Conditions and Workflow” category serve to move contacts’ places in automations, direct them to new automations, or end automations altogether. The “Goals” action is useful for springing contacts ahead in automations when they achieve a goal earlier than you anticipate; therefore, they do not receive any redundant or unnecessary messages. You use actions in the “Contacts” category to automatically update contact information. You can subscribe and unsubscribe contacts from lists, change custom field values, and add and remove tags. Plus, you can adjust contacts’ lead scores. Ultimately, “Contacts” actions help ensure your contact database is up to date. That, in turn, means that new automations — and the segments you create in them — use updated data. Thus, relevant engagement persists. 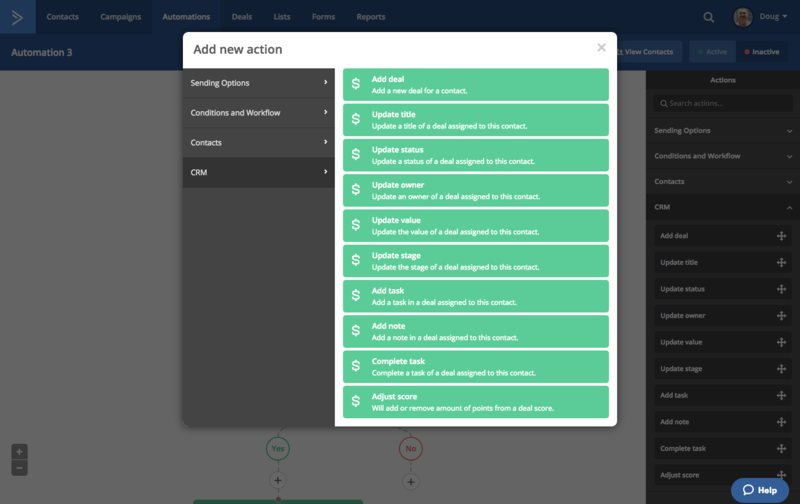 “CRM” actions compose the final category. As the name suggests, these actions affect your CRM. Remember, your CRM is a visual representation of your business processes. You can easily track and manage the progress of contacts through your pipelines, and you can even use the CRM to project revenue. You use “CRM” actions to automatically alter the necessary data, thus ensuring you and your team are on the same page and the data in your CRM is up to date. The “Adjust score” action in this category adjusts deal scores, while the “Adjust score” action in the “Contacts” category pertains to contacts’ lead scores. This guide merely scratches the surface of all you can do with automations. The flexible nature of ActiveCampaign is evident, as you can create a seemingly endless variety of automations. Stay tuned to the Education Center for content that analyzes specific automations and suggests best practices in certain use cases. For now, we hope this guide helps explain the purpose of automations and the features in them. Feel free to tinker with the automation builder. Experimentation is often the best way to learn! Please note: we recommend testing automations before activating them, and that process is easier than ever. Still hung up on what automations are or have another way to explain them? Tell us in the comments!